From the New York Times, July 8,2008. If it’s summer, it must be time for safety warnings about outdoor sports. So here is a surprise: measured by the rate of injury while participating, the most dangerous outdoor recreational activity by a wide margin is snowboarding, followed by sledding. 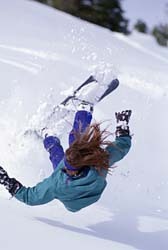 The snowboarding accident rate is higher than the rate for summer pastimes like boating, camping, fishing, hiking, mountain biking, swimming, and water-skiing — combined. Researchers at the Centers for Disease Control and Prevention used 2004 and 2005 data from the National Electronic Injury Surveillance System, a program operated by the Consumer Product Safety Commission, and published the results in the June issue of Wilderness and Environmental Medicine. The survey gathers data from 63 hospital emergency rooms nationwide. Arlene Greenspan, a senior scientist with the Injury Center at the Centers for Disease Control and Prevention, offered advice that was applicable regardless of the season. “We want people to be outside, exercise, and enjoy themselves,” she said. “But people need to be cautious. More than 68 percent of accident victims are male, but that is to be expected, since men and boys have higher rates of participation in outdoor activities. A quarter of the victims were 14 or younger, and a third were 15 to 24. About one other winter sport that is conspicuously missing from the tables: the researchers were unable to gather enough reliable statistics on skiing to estimate its dangers, or to compare its injury rate with that of snowboarding.